I have always been a fan of the Asics Gel Resolution line of shoes, with my favorite being the Asics Gel Resolution 6. Well, up until now. I was looking for a shoe with good support and fit, and for me personally, edition 7 was an improvement. But let us dive deeper into my Asics Gel Resolution 7 shoe review. 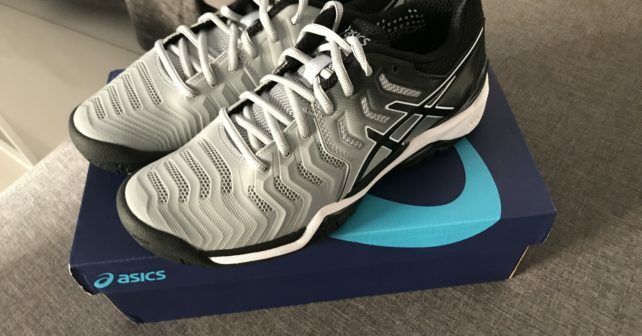 Before I splurged on the new Asics Gel Resolution 7 , I considered the new Yonex Power Cushion Eclipsion 2 (“a handful name”), but just felt the fit was slightly better for my high-arched feet in the Asics Gel Resolution. When you purchase a new pair of tennis shoes, like with a tennis racquet, testing them is of course always advised. But if you want my opinion about these shoes, keep reading this Asics Gel Resolution 7 shoe review. So what is new with the Asics Gel Resolution 7? For starters, I think the fit in the toe area is better, which made them great for me from the first hit. For some, with wider feet, I think the compact and stable toe area might be an issue and will require some players to go for a half size larger. But for me, with my slightly narrow, high-arching feet, it is just a perfect fit. Another issue with the Asics Gel Resolution 6 was that the heel section of the shoe felt a bit too roomy at times, and it made me look for a bit more support. The Asics Gel Resolution 7 makes my feet feel more locked-in, and they offer better support than the predecessor. With my recent knee injury woes, good support and cushioning was exactly what I was looking for and these shoes really do that well for me. First of all, I must say I was surprised that this edition pretty much solved all my issues with the predecessors. Things that work better for me: support in the heel and toe-area and cushioning around the whole foot. The durability, weight and traction is very similar to the previous version. On the whole, I would say these are all around average compared to other shoes, but I believe the cushioning and fit is the most important factor with tennis shoes. For me personally, the fit and support of the Asics Gel Resolution 7 is hard to beat. I tried around 6-7 pairs of tennis shoes before I committed to the shoe, and I have of course played with loads of different tennis shoes over the years, and this is the best one so far. Bulkier shoes usually offer better durability, such as the Adidas Barricade for example. But then you usually have to sacrifice a heavier feel and a longer break-in period. Asics Gel Resolution 7 offers decent durability. Not worse and not much better either than most tennis shoes. Most wear and tear is on the soles and that is a good sign. Compared to the Wilson Amplifeel shoes (read my review) I used before, where there were issues with the straps and the sock of the shoe. You get a 6 month outsole warranty with the Asics too. With my troublesome knees and sometimes slippery courts in Malta, this is important for me and I think the Asics maintain good traction even after the tread pattern has gone a bit. The grip is good with these shoes. These are not “speed” shoes but they are not heavy and slow either. I think they are in the middle range, now that there are a lot of shoes that talk about speed. I rarely have an issue with the weight of the shoe personally, so this is a non-issue for me. If you want “faster” shoes, there are many options on the market. The Asics Gel Solution Speed 3 is a good one. I am really happy with my purchase of the Asics Gel Resolution 7. They offer pretty much everything I am looking for in a shoe. They offer the dampening, support and snug fit I want without being too bulky/heavy or slippery. Just a top class tennis shoe. I used to be a fan of the Nike Zoom Vapor Tours which offer amazing comfort, but the durability have always been an issue there and I think the Asics Gel Resolution 7 are a more all-round alternative. Timely review. I’ve been considering these shoes as I realized that I’ve been suffering from plantar fasciitis, so I need to go for different shoes once I recover.